Thank you to Lexington Law for sponsoring this video and post. I’ll be the first to admit that saving for some things is more fun than saving for others. Saving for a tropical vacation with friends is more appealing than putting money aside for my kids’ college accounts for them to use 15 years from now or a hypothetical house we might buy in the future. But if we don’t start putting money aside now, we’re missing out on some great opportunities for the future! The big question is: How can we save for the future, without it feeling like a huge burden and taking away from things we want to do in the present? We’re going to go over a few questions to ask yourself and then get into saving strategies. Do you want to own a home? If so, where would you want to live? Do you want to own a car? If so, what type of car? Do you want kids (or have kids) and is contributing to their college tuition important to you? Would you consider yourself healthy or are there some medical issues that you might need to tend to (upcoming surgeries, chronic health issues, etc.)? What age do you want to retire, if at all? 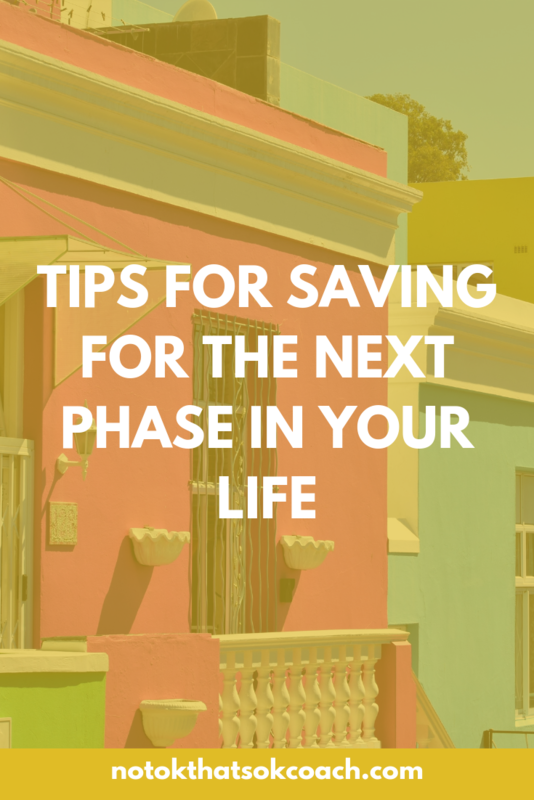 Now, that you’ve answered those questions, lets break down what you can do to get ready for if you’re thinking about a big purchase in next phase of your life. The first thing to keep in mind is your credit score as this can determine what interest rate you’ll get. According to Lexington Law, if you have damaged credit you could be looking at rates over 6% as opposed to 3.9% with excellent credit. This is thousands of extra dollars over the lifetime of the loan. If you’re thinking buying a home is in your future, do your research on the average cost. A 2- bedroom townhouse in the burbs is going to look quite different to a similar style in the city and knowing the price tag is key. Yes, this will go up and down but getting a general gauge will help you see the reality of what you’re looking into. Once you have the average cost, note that you’ll probably need 20% of that total for a down payment. If you’re thinking about buying a car, check out the list price for new and used cars on company websites. You might be asked to put an initial payment down on the car or you’ll have larger monthly payments. I’m a big fan of automatically taking money out of my paycheck and putting it into a savings account. If we don’t see the money, it’s almost like it doesn’t exist (for now). Try with a small amount (even $20) a paycheck and have it automatically put a separate account you’re not going to touch until you need it for your first big purchase (home, car, etc). Even with $20 a paycheck with getting paid weekly, you’re saving over $1,000 a year. When you’re saving for a big purchase like a home, you’ll need more cash up front. A great way to build up your account is to put aside any “extra” money. Think bonus, gifts, and tax refunds that you’ll deposit in your savings account just for the purchase of a home. Make sure you have a plan to increase your credit score. No one wants to pay more money for the same thing. With damaged credit, you could be paying $130,000 more in interest for a $250,000 house than those with excellent credit. You can reach out to Lexington Law for a free credit consultation and they will review your score and guide you on how to personally improve it. Next, let’s talk about kids. If you currently have kids, starting a 529 Plan is a great option. This money specifically goes to their educational expenses and it is a tax-advantaged educational savings options. You can reach out to your current bank and open one through them. If you don’t have kids and are thinking about it, don’t be freaked out but check out the cost of some expenses (childcare, diapers, and other necessities). Many childcare centers post the costs on their website, so you have an idea of what you’re looking at. If you already have kids, suggest to relatives and close friends to make contributions to their 529 Plan as opposed to toys and other gifts. If you and your partner are considering a family, have a conversation about your financial health as a couple and your plans for childcare and college so you’re both on the same page when the time comes. Next up, health and medical expenses. Look over your past few years of medical expenses and see if they have been increasing, staying the same, or even decreasing. Get a gauge on how much you spend on prescriptions, doctor’s appointments, and think about potential larger medical expenses you might have in the future (surgeries or medical procedures). If you haven’t already, make an annual physical appointment to check your overall health to see if there is anything you might be missing. You also want to look into a Flexible Spending Account (FSA) which is pre-tax money deducted from your paycheck that goes directly to medical expenses. When the time comes for those doctor’s visits or to pay for a prescription; you already have the money saved and since it’s pretax, you’re getting more money to put towards your medical expenses. Keep in mind that if you’re a healthy person you might still have some larger expenses. Your FSA and savings will be helpful if you need it. Let’s now move on to retirement. It might seem like a million years away, but retirement will hopefully be a part of your future. There are a few things you can do to get free money and ensure you have a savings to tap into. If you haven’t already, start a 401k. This is usually a benefit provided by your organization and you can enroll during open enrollment (typically October/November). If your company doesn’t offer a retirement plan, you can open one on your own IRA (either traditional IRA or Roth IRA). Being able to visualize what you want for your next phase in life will give you something to work towards. Once we know what we want and are determined to get it, creating a plan to save becomes more doable and something we’re willing to work for. We know we’re putting money away for our kids to go to college, live in the home we want, and actually be able to retire. The professionals at Lexington Law are here to help and can provide you with personalized assistance so you can repair your credit and set yourself up for financial success for the next phase of your life.